Continuity: The only official short fiction to feature the Nth Doctor. Synopsis: The TARDIS has been trapped on a dead, forgotten world, its arrival in a sealed subterranean cavern sending vibrations through the rock. The chamber is acting as a “stone tape,” the Doctor observes, preserving living shadows and eternal hunger. Exploring the cave, Alison is overwhelmed by psionic stimulation, wave after wave of emotional memories drowning out her consciousness. Caught in the grip of shadows that emerge from the darkness, she takes her place atop a blood-stained sacrificial altar. As the Doctor desperately struggles to release her, he discovers the terrible truth driving this ravenous force. There is a great evil that dwells within the TARDIS, too. The unrivalled hatred and malice in the soul of the Master has aroused the hunger of an insatiable psionic parasite. His very presence aboard the TARDIS may ensure its doom. This entry was posted on 21/09/2015 by hedgewick. 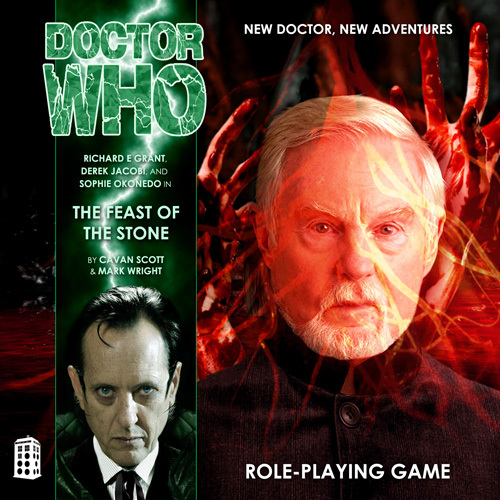 It was filed under The Nth Doctor and was tagged with Alison, Episodes, The Feast of the Stone, The Master.